It's been an incredibly hectic week at the office. I think I spent more this week eating out than in the last 3 months combined. That's probably very much hyperbole, but I think the only meal I ate in the office was on Tuesday. Everything else was take out. So, I hit up my usual Subway. One of the staff finally remembers what kind of sandwich I like. October 1st, they introduced a new bread and she recommended I try it with my usual. 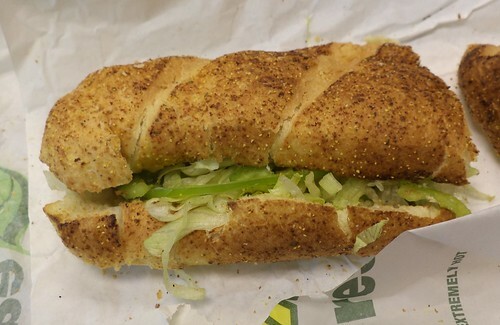 This is Subway's garlic bread. It's really a white bread with a garlicy topping as opposed to a garlic infused bread. Sure, why not. I'll give it a try. I got my usual; turkey, lettuce, green pepper, spinach and a line of yellow mustard. It's okay. It does not seem to have been designed to add additional flavor to the sandwich. It would almost be better if they didn't have a garlic sprinkled bread and just give you the option of adding garlic to the sandwich. I love garlic but this bread seemed dull. Perhaps, however, a Subway sandwich is not where one should find garlic unless it's infused in, say, their chicken. I've taken a shine, lately, to the flatbread. It seems to compliment the insides better. Sometimes I think the amount of bread diminishes how much of the ingredients inside the sandwich they can add. But, if you're looking for something a bit different, the garlic bread won't offend you.